Serrated pale green meal-coated leaves and lavender-lilac flowers. An attractive and rarely offered evergreen perennial with spoon shaped, serrated pale green leaves forming rosettes. 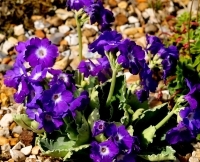 These rosettes quickly multiply to form mounds of flowering shoots and can be multiplied by simply dividing this mound. New growth in spring is covered with a mealy (powdery) coating and makes the foliage more attractive just before flower emergence. These rise on sturdy stems and are held in bunches of 3 to 20 or more. Removal of dead flowerheads will often force a second flowering. Flowers are rounded and usually have an eye. 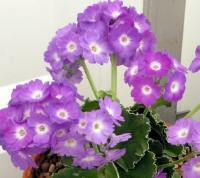 Primula x Wharfdale Bluebell X Primula x marginata Linda Pope.